Much has been made over the possible “Liverpoolisation” of Manchester United. United is mounting a desperate challenge to qualify for the Champions League, but with some irony faces elimination from the seemingly winnable Europa League at the hands of the old enemy, Liverpool. Not only is local rivalry and progress in the Europa League at stake, but there is an imperative for United to come back strong and set a positive tone for the remaining few games of the season. Should United offer up a performance in the second leg as pathetic as the one last Thursday it will surely sap all momentum from the Reds. United’s two goal deficit is not insurmountable although the Merseyside club has enjoyed an extra two-day rest. Indeed, a close analysis of the first leg reveals areas where United can improve and weaknesses in Jürgen Klopp’s Liverpool side that the Reds can definitely exploit. Klopp insists on a high line and hard pressing game, as above in Figure 1. Not only does his side leave gaps behind the central defenders, but there is also plenty of room to exploit that advancing full-backs vacate. Indeed, United consistently tried to exploit the gap on the left flank last week – Maroune Fellaini was ostensibly included to facilitate United’s attack down the left. Liverpool’s wingers, Phillipe Coutinho and Adam Lallana, were also aggressively positioned last week – a pass to the right on Thursday could easily isolate the visitors’ full-backs. In Memphis Depay and Anthony Martial United can field two players that are very good in one-on-one situations. Last Thursday Jordan Henderson and Alberto Moreno resorted to fouling to stop Marcus Rashford on the right flank – the Spaniard picked up an early yellow card as evidence. In the second leg James Milner will return from illness and Klopp will probably deploy the former Manchester City midfielder against United’s right flank to protect a weakness in Liverpool’s unit and that two goal lead. Liverpool’s risk? Should United make a sustained effort at exploiting the flanks the Reds might very well turn things around in dramatic fashion at Old Trafford – though much of the action will be down United’s left and not the right. This is easier said than done of course. United tried to engage Memphis in the first leg, but the team enjoyed only one shot on target to show for the work and Liverpool completely dominated possession. While counter-attacking does not depend upon possession – indeed it is usually aided by the lack of it – Liverpool forced United back in a way that prevented quick bursts down the flanks. This is the key area that must be closely analysed before Thursday. Liverpool had a strong game plan and the players carried it out well, but ultimately it was Van Gaal’s team that shot itself in the foot. When United tried to transition into attack, Liverpool pressed United’s defenders heavily, as in Figure 2 above. 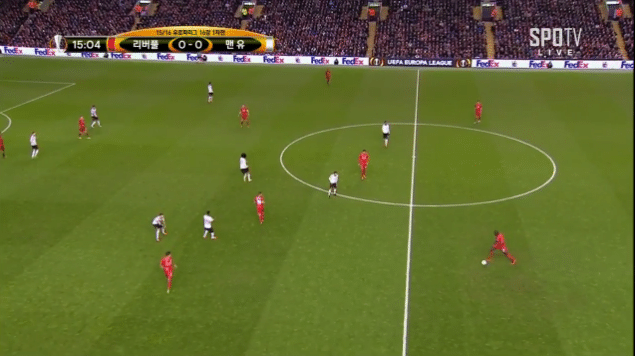 Not only did Klopp’s players press, they always had a man on Fellaini to prevent the Belgian from turning. Van Gaal shifted to a back three by introducing Michael Carrick in the second half to ease the transition from defence to attack – and it did help a bit – but if United is to get anything at Old Trafford the transition must be much quicker. The second half tactical shift suggests that the Dutch manager is well aware of the core problem. Because United was pinned down for much of the game Memphis had no support on rare occasions that the Dutch winger got the ball quickly. It was the same story for Juan Mata. The Spanish midfielder didn’t see much of the ball, as Liverpool midfielders shut down the passing angles, while Martial was isolated and the hosts were able to quickly regain possession. In fact, with United players spread all over the pitch, Liverpool’s holding midfielders, Jordan Henderson and Emre Can, easily ran past Mata and into United’s defensive third, as above in Figure 3. This meant that Liverpool runners came deep into United’s half untracked and in space, as in Figure 4, pulling the visitors’ defence out of shape – and further pinning the Reds back. Another issue was Fellaini. When Liverpool had the ball, Fellaini was easily pulled out of his position, as in Figures 5 and 6, above. The Belgian also frequently left Firmino unattended. It is hard to fault the Belgian for his lack of defensive nous though – he is not suited to being a holding midfielder in a 4-2-3-1 system. Notwithstanding this, Fellaini frequently ruined United’s defensive shape. It is clear how Klopp’s game plan can be fought. Memphis must work the left flank to exploit the glaring weakness in the former Borussia Dortmund manager’s strategy. Last Thursday he usually got the better of Nathaniel Clyne, Liverpool’s right back. Liverpool’s holding midfielders must also be stopped from joining the visitors’ attack at Old Trafford. Morgan Schneiderlin should keep his place, with Fellaini stepping aside for Ander Herrera. Herrera’s naturally positive distribution will aid United’s counter-attacking, while the Spaniard’s diligence ensures that Memphis and Martial are not isolated, as below in Figure 7. In essence this means that United’s best shot at victory is a switch to a 4-3-3 formation. The extra central midfielder will match Liverpool in terms of numbers while providing support for Memphis and Martial. Another man in the middle means that the Dutch winger can be pushed higher up the pitch, à la Cristiano Ronaldo. With Liverpool’s central midfield evenly matched by United’s trio, Van Gaal’s side will not be so easily pinned down at Old Trafford. For this to work Mata must play on the right ahead of Jesse Lingard. The Spaniard has performed well against Liverpool in that role previously because he can cut in from the right and overload Liverpool’s two defensive midfielders. The likely deployment of Milner means that there is probably little to be gained by a traditional winger on the right flank anyway. If Milner focuses on a role as a ‘defensive winger’ by covering Guillermo Varela United will outnumber Liverpool in the middle. If Milner follows Mata into the centre, Varela will be free to go one-vs-one against Moreno, with Martial lurking in support. Recently, this column has gotten into the habit of betting against United – unfortunately, a loss or a draw has become the probable result for the Reds this season. On scrutinizing United’s first leg defeat to Liverpool, however, the outlook is more positive than many predict on Thursday. But only if Van Gaal gambles and opts for a positive 4-3-3 system. Fellaini will be getting sent off as the European Officials are now wise to his dirty karate chop elbows to the throat. 1. The Reds – This is the nickname of Liverpool FC not Manchester United who are the Red Devils. 2. Milner was not suspended for the last game he has a virus so was unavailable due to that illness. His suspension will be for the next domestic game as he was sent off in the Premier League. 3. There article make a very large assumption that Klopp will line up and play exactly the same as the first leg tomorrow night. That is a big presumption. 2. Fair enough. My bad. It’s a shame that Schweinsteiger is not so fit. Would be ideal in mentioned formation in place of Carrick. I would almost never put Schweinsteiger at the base of a 4-3-3 central midfield. He has almost always been abysmal when he played there. Nice heading picture really like the shades on it but its confusing though, I mean why do the rest of team have their back turned? Was Couthinio coming in late for the celebration? If so, why is Frimino still doing the finger thing on the touchline.? Nice but strange capture. Anyways IMO I doubt LVG would yield to common sense and drop Fellaini for Herrera(who is obviously ten times better). If he does we can win this tie I mean ffs we won four games on the trot without Fellaini then his back and we loose two on the bounce I mean LVG really nuts or what? What’s he doing? Nice article Jay. I could see us winning this leg 2-1, like Ed and Paul said in the podcast. All out offensive blitz? What have we got to lose?